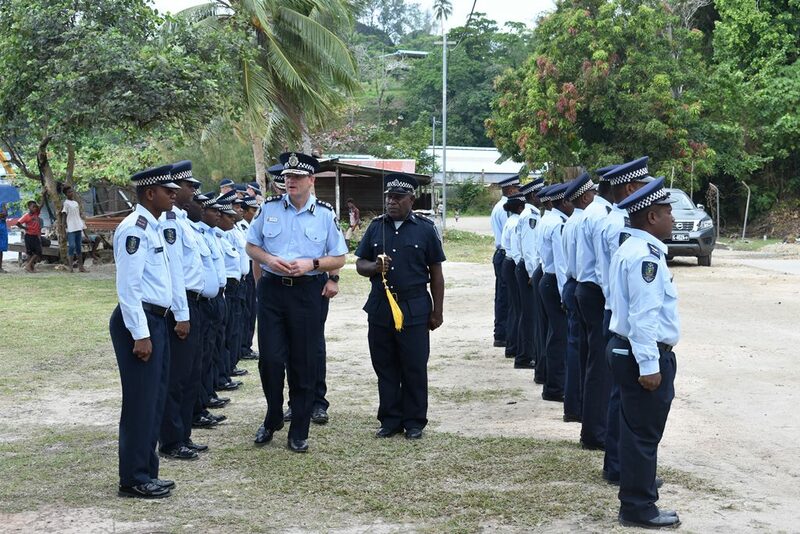 The Royal Solomon Islands Police Force (RSIPF) today show-cased the capability and challenges faced by its provincial police stations when it took the visiting Australian Federal Police Commissioner, Andrew Colvin on a visit to the Tulagi Police Station in Central Province. “I am very impressed with how Tulagi Police Station under the leadership of Provincial Police Commander, Superintendent Patricia Leta has been able to take the lead in the roll out of the Crime Prevention Strategy especially in establishing Ward Crime Prevention Committees resulting in communities working together with the police to prevent crime in the Central Province,” says Commissioner Varley. During the short visit, AFP Commissioner Colvin inspected a parade by RSIPF Officers at the Tulagi Police Station and also toured some of the historical sites in the township as the first capital of Solomon Islands. Other guests during the visit included the Australian High Commissioner to Solomon Islands H.E Roderick Brazier, Commander of SIPDP, John Tanti and other SIPDP Advisors and RSIPF senior officers. The AFP Commissioner Andrew Colvin is currently on a three-day tour of the RSIPF.